The Maritimo 470 Offshore Convertible is a modest vessel: masquerading as a 47-footer its hull length is actually 54ft. And being Australian-built it uses a well-judged share of that for the cockpit; local preference is some open air aft of the saloon. An enormous hopper window plus the door practically brings the cockpit into the saloon, or vice versa; it adds up to a large continuous entertainment space. The flybridge works on similar well ventilated lines. 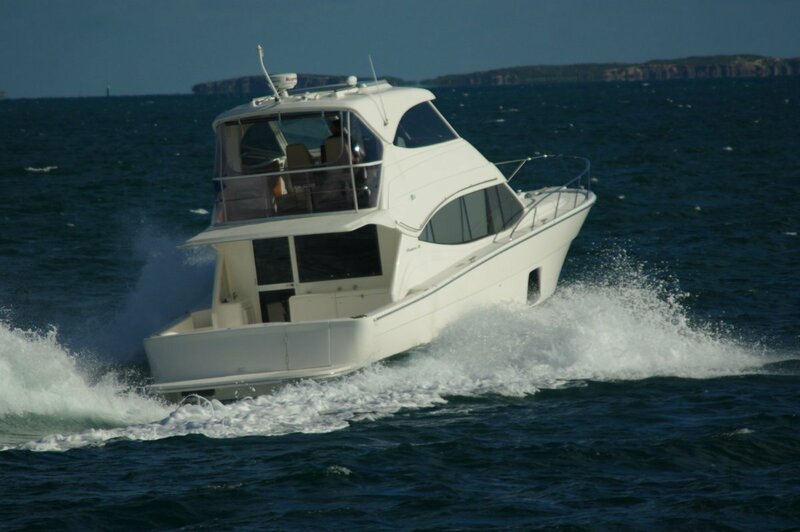 By ‘convertible’ Maritimo means an enclosed flybridge except for the rear – which can be closed by clears. With clears furled and the skylight slid back this is as near open air as makes no difference. One glance from outside tells you the 470 has just the upper station: no windscreen downstairs. Which of course automatically enlarges the saloon and recognises that even on twin station boats nearly all driving is done up top. The saloon’s layout emphasises space by having L-shaped settees – all upholstery is leather - diagonally opposite each other, the after one with a table adjustable for size and function, and with a view of the vast TV. 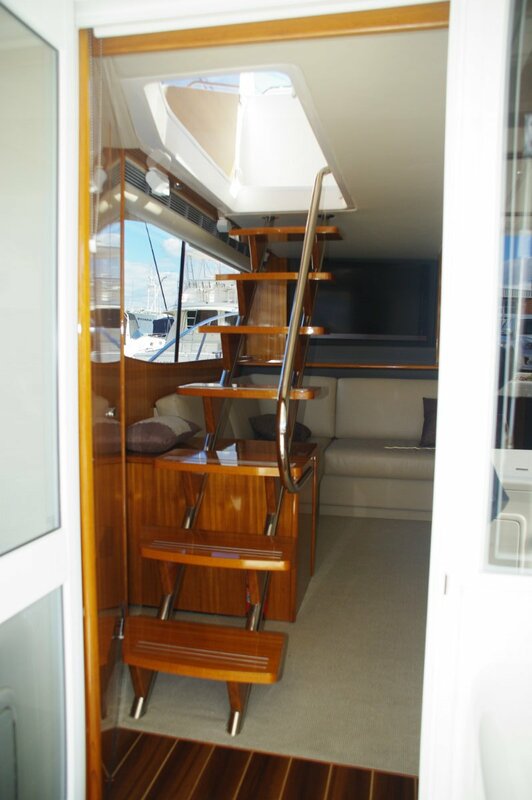 The other corners are taken up by the galley and the open tread stair to the flybridge with cabinets beneath. 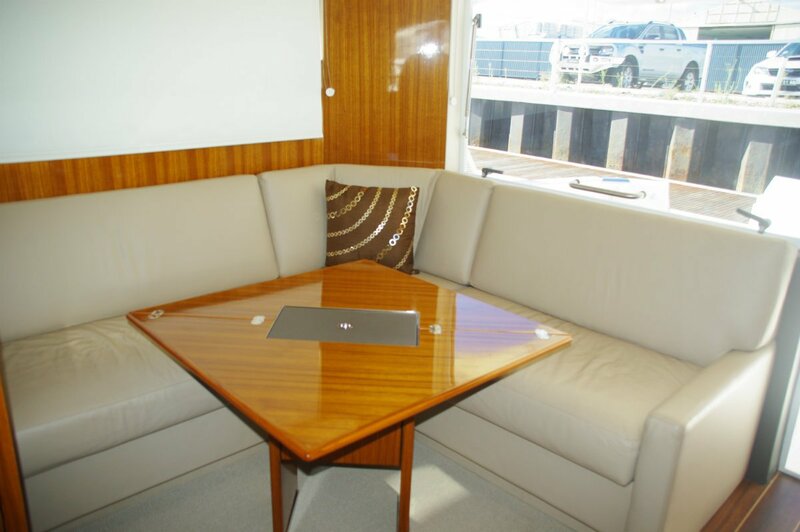 The galley has been given plenty of space – and equipment – and has a timbered splash zone let into the carpet. 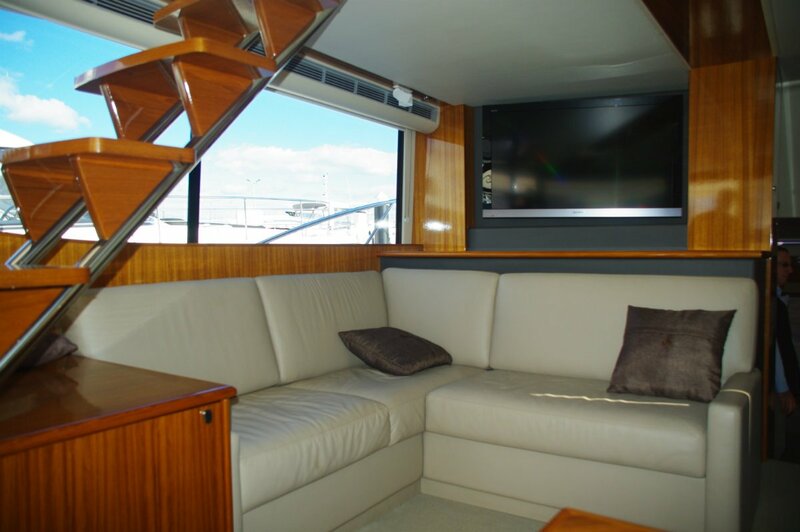 The flybridge is a smaller scale saloon as well as a control station. It has a repeat of the dinette, a bar fridge, a sink and a balcony overlooking the cockpit. With the access safety hatch and rear clears in place it becomes an air conditioned refuge. It can of course be a refuge in reverse for parents who can banish the children up there with their music. The sleeping accommodation has the unusual arrangement of two doubles and one single. The single is as big as most twins so the occupant will feel he is still in first class; all that is missing is the TV the others have - that and sharing the forward cabin’s en suite bathroom. 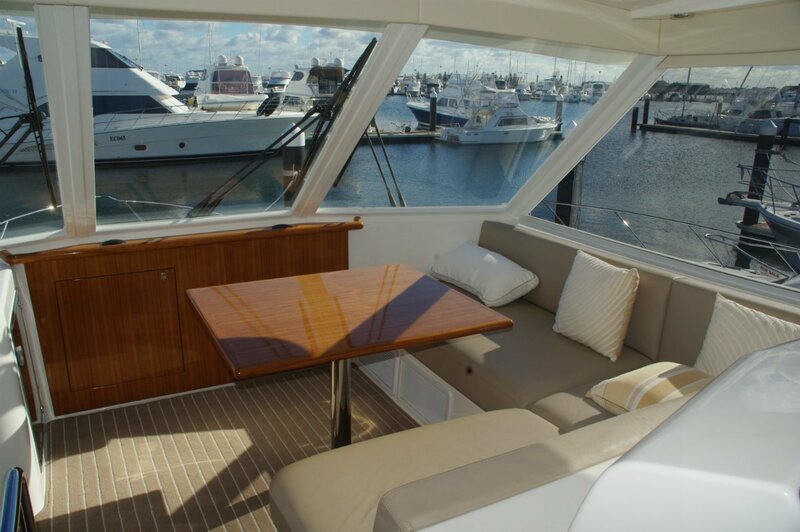 The midship cabin has the fashionable large, low level windows of which I am a fan: natural light is best, and to be able to look out at the ocean while lying in bed is better than best. In my usual nit picking fashion I checked the joinery and cabinetry for accuracy of fit and finish; it was excellent, as was the fit-out generally. The cockpit and swim platform have teak laid decks to suit a vigorous lifestyle at anchor, and the equipment for an alternative to indoor cooking and dining. The refrigeration, electric barbecue, sink and other domestic appliances would be the first choice at anchor for probably most people. 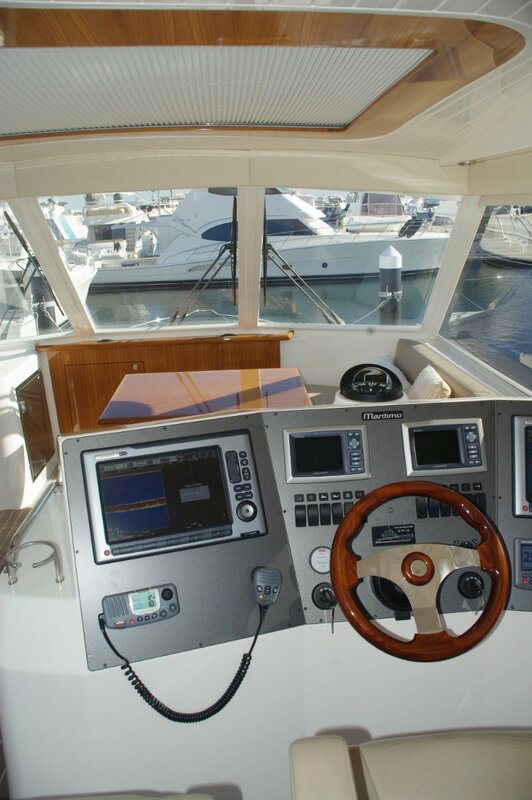 And besides being a social space, the cockpit retains the functions of a traditional Australian sports fisher. You can fish seriously from here, and you have plenty of room in it and on the swim platform for a bunch of swimmers or divers who are generally all elbows. Access to the engine room from the cockpit is tidily arranged and easier to navigate than many. The space is not extravagant, but the main engines and the 11kW genset are thoroughly accessible. Shaft sections are generous, and the installation top quality. The Twin Cummins are linked to the Twin Disc Express joy stick system, a system that uses hydraulic thrusters fore and aft. Most thrusters are electric, and in a serious sideways session can overheat and lose interest; hydraulic just keep on going. 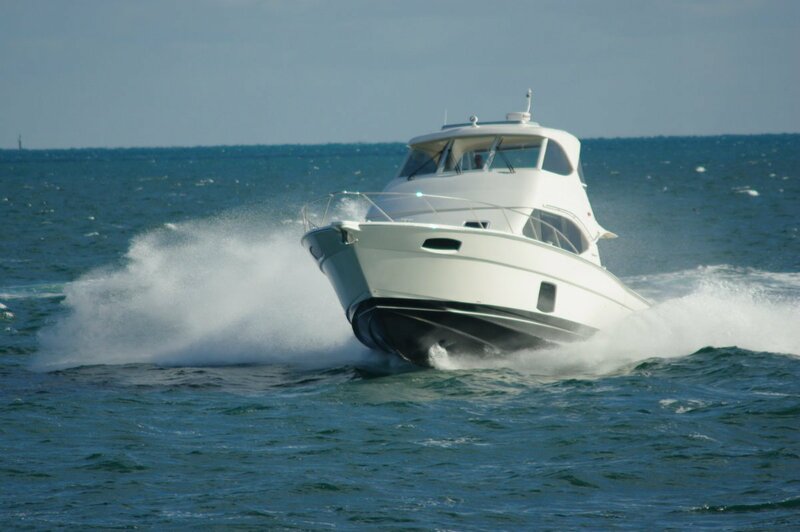 The motors’ combined 1,200hp is good for over 30 knots and your choice of cruising speeds. 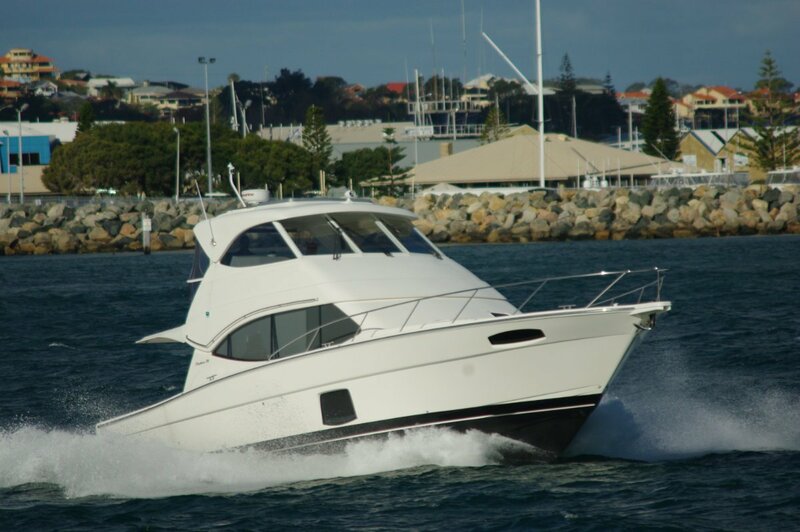 Not a lot of far ranging cruising takes place on the west coast, but the Maritimo is ready any time its owner is. At 18 knots there are 500 miles in the tank, still leaving a ten percent reserve: Carnarvon in one jump. Little thought-of advantages traditional shafts have over pod drive systems are the deeper veed bottoms they allow, giving improvements in the ride, and the reduced movement the partial keels give at anchor.